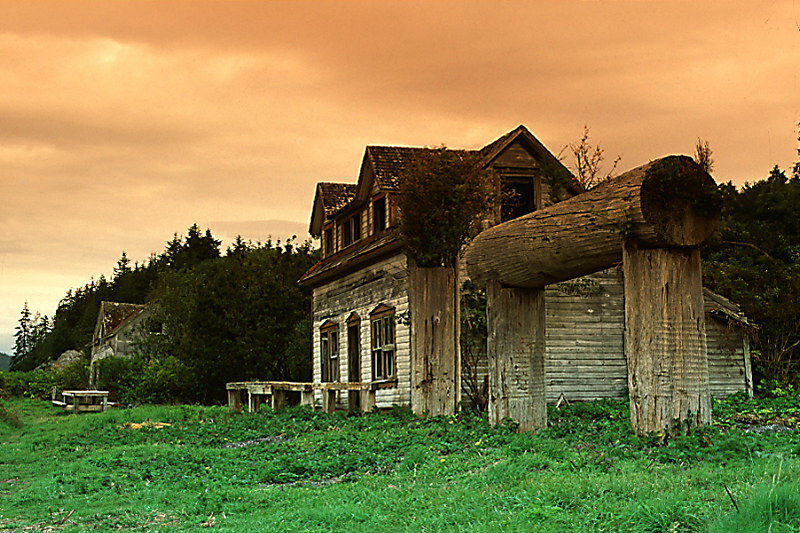 Once a Forest Ranger Station, Echo Bay is located on the north side of Gilford Island, near the east end of Fife Sound in Cramer Passage, off the northeast coast of Vancouver Island. Formerly known as the Kwakiutl, the Kwakwaka’wakw First Nations have lived here for thousands of years, a region with a history rich in native culture and heritage. Pictographs, burial sites, and shell middens offer a fascinating glimpse into Kwakwaka’wakw and Coast Salish culture and history. Echo Bay was originally called Echo Cove because of the reverberations of sound from the cliff on one side of the bay. Echo Bay provides outstanding cruising, kayaking, fishing, exploring and wildlife watching. Many islands, both large and small, are only a short distance away with protected waters for cruising and exploring, and the many channels and fjords make this a fisherman’s dream. Location: Echo Bay is located west of Broughton Archipelago Marine Provincial Park, approximately 30 miles northeast of Port McNeill. Echo Bay can be reached by boat through Retreat Passage or Cramer Passage on the northwest side of Gilford Island, with departure from TTelegraph Cove, Alert Bay and Port McNeill on northern Vancouver Island. Floatplane access is available by daily seaplane service between Seattle, Port McNeill, and Campbell River. The Resort on the north side of Gilford Island is a great base from which to explore the Echo Bay area, providing a marine store, grocery store, boat marina, moorage and boat rentals on the west side of the entrance to Echo Bay. Accommodation is also offered in housekeeping units, a Penthouse, Yurt, and the main Hotel unit. Learn about the history and way of life of the Broughton Archipelago at Echo Bay’s Private Museum created by lifelong fisherman and beachcomber Billy Proctor. The ‘junk collector’ was born in a shack in the woods in Port Neville, across from Kelsey Bay, and grew up in Freshwater Bay on Swanson Island, where his parents ran a fish-buying camp. The artifacts, some of which go back 6,000 to 8,000 years, represent different cultures and include 400 stone and bone artifacts, old hand logging equipment, old animal traps and skinning boards, and 1,300 old bottles. Entrance is by donation, with the proceeds going to support salmonid enhancement at Scott Cove hatchery. Kayaking: Broughton Archipelago and its maze of intricate islands and waterways provide some of the nicest paddling in BC. Highlights include the Sedge Islands to the west of Bonwick Island, and the large camping area on the southern tip of Insect Island. Owl Island and the Echo Bay Marine Park on Gilford Island provide additional campsites. Several island groups await exploration by kayak, including Burdwoods, Benjamin, and Fox Islands. Cruising: Boaters can explore the many nearby fjords, inlets and bays. Waterfalls, cliffs, and high mountain peaks provide a backdrop for picturesque wilderness cruising. Fishing: These waters are exposed to the vast numbers of salmon migrating through Johnstone Strait and down the east coast of Vancouver Island, providing excellent fishing for several species of salmon (coho, pink, sockeye and springs/chinook/king). The best fishing for Coho is mid July, August, and early September, for Tyee (Chinook) from late April to mid August, and March to September for Halibut. Fishing is also good for halibut, rock fish, and cod, as well as clams, crab, and prawns. 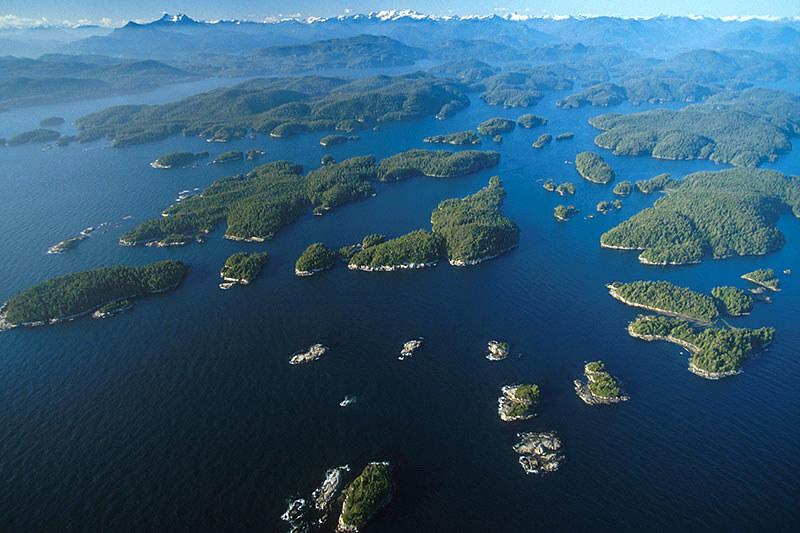 Air Tours over Broughton Archipelago and Kingcome Inlet are operated out of Alert Bay on Cormorant Island. 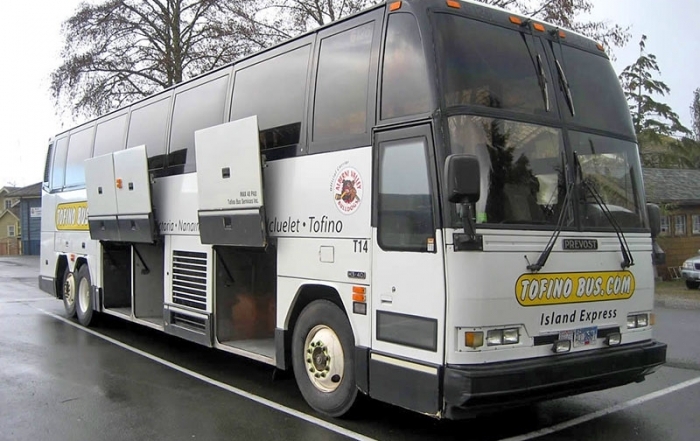 Wildlife: The region is home to a northern population of resident killer whales (Orcas), with the salmon feeding areas and rubbing beaches of Robson Bight south of Telegraph Cove on Vancouver Island being a preferred site. Other marine mammals include Pacific white-sided dolphins, harbour porpoise, Dall’s porpoise, resident harbour seals, and wintering Steller sea lions. Other wildlife in the area includes deer, bears, shorebirds, seabirds, loons, and bald eagles. Broughton Archipelago Marine Provincial Park is a wilderness area consisting of a maze of several small islands, islets and adjacent foreshore at the southern extremity of Queen Charlotte Strait, off the west coast of Gilford Island. The remote, solitary islands are undeveloped and largely undiscovered, and provide unlimited and unique fishing, kayaking and swimming opportunities. 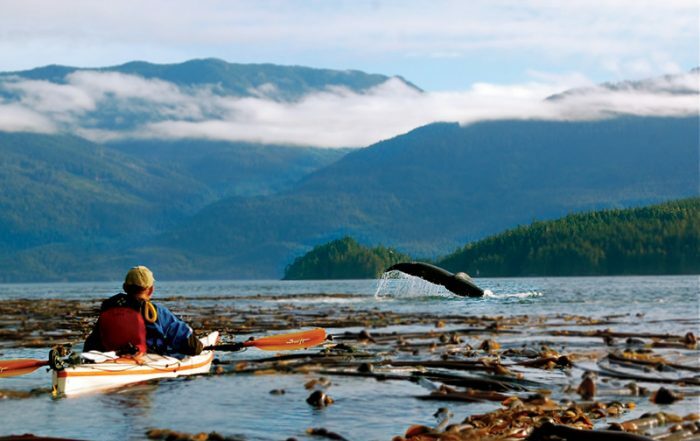 Echo Bay Marine Provincial Park is located south of Kingcome Inlet, on the western shore of Gilford Island. The facilities are basic; 70-foot floating dock for small craft, walk-in campsites, picnic area, a walking trail, water and one pit toilet. Good fishing. There is a small wharf to tie up to, and fuel, moorage and supplies are available at Echo Bay Resort, adjacent to the park. Other amenities available at Echo Bay include a Post Office, Grocery Store and Arts and Crafts stores. Anchorage in Echo Bay is not recommended, but nearby Shoal Harbour provides good holding. 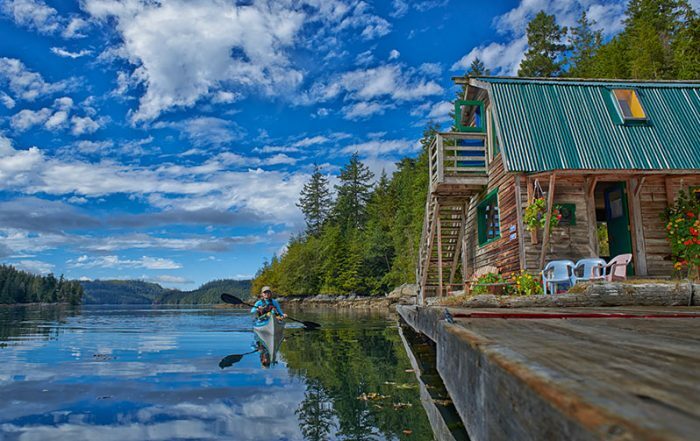 Telegraph Cove is a major destination during the summer months, when the snug little bay bustles with boaters, anglers, campers, kayakers and whale-watchers. The tiny town Telegraph Cove, one of the last boardwalk communities of eastern Vancouver Island, is worth a visit even if you’re not planning to do any offshore exploring. Alert Bay is North Vancouver Island’s oldest community, located south of Kingcome Inlet. Alert Bay was an important trading centre for early residents in the area, and is the traditional home of the Namgis First Nation. 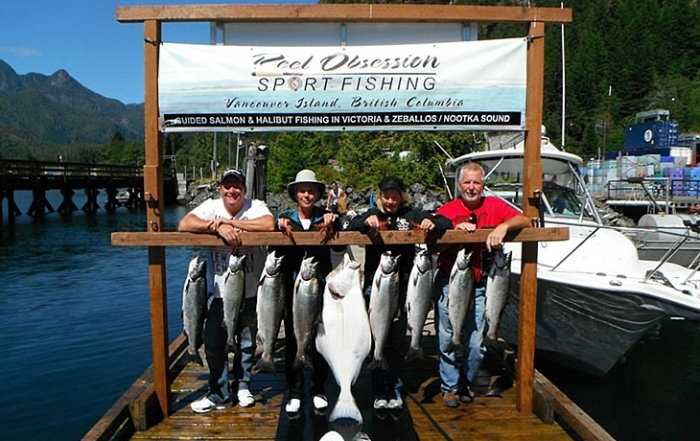 Port McNeill on Vancouver Island has a sheltered harbour that serves as a launching point for sportfishing enthusiasts who test their skills in the maze of waterways between Vancouver Island and the mainland, including Kingcome Inlet. Kingcome Inlet is an isolated fjord north of Echo Bay, set against the breathtaking backdrop of great towering mountains and carved into the Coast Mountain Range of mainland British Columbia.